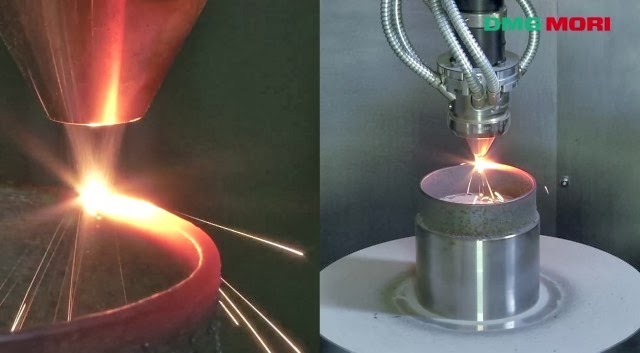 On the other hand, 3D additive laser printers will never have this kind of accuracy and will invariably need to have secondary subtractive machining done to them to get the final part. The solution to these issues is a machine like the DMG Mori hybrid mill. Recently demoed at the Euromold show in Germany, this machine can bring the most difficult of designs to life right before your very eyes. It is the result of a collaboration between Mori and Sauer Lasertec to combine 5-axis mill capability with 2 kilowatts of diode laser fusion power. Finally, any good machining head needs to have “through spindle” coolant which blasts through the center of the spindle actually the rotor of an integral motor spindle. This feed itself is no slouch, usually 1000 psi at fairly decent flow, and so capable of doing some additional sidework. This same line can be co-opted by the laser head to source air to provide the “assist” needed to blow out the kerf (if for example also doing laser cutting). So it is not impossible to build such a machine, and indeed it appears to have been done successfully. We might now look forward to marvellous things; the at-home replicator, capable of producing just about anything, creeps ever closer to reality.